We're pleased to offer our famous New Year's Brunch which offers a gourmet selection of breakfast favourites. Our market fresh buffet features made to order omelettes, fresh Belgium waffles, assorted fresh salads, an exceptional selection of hot items, carved hip of beef, freshly baked cakes, pastries and pies. Please see our menu for selections. 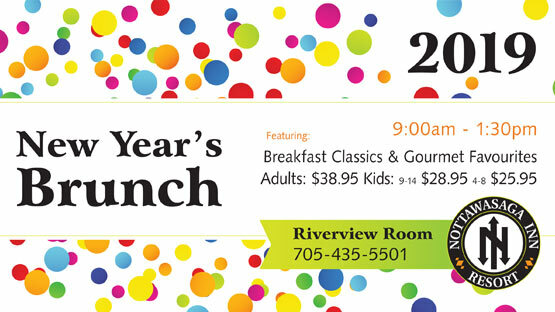 New Year's Brunch is served in the Riverview Dining Room from 9:00am to 1:30pm. Reservations not required, first come, first served.